A comprehensive eye exam includes a number of tests and procedures to examine your eyes and evaluate your eye health and the quality of your vision. 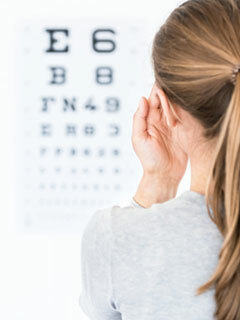 These tests range from simple tasks such as reading an eye chart, to complex procedures using sophisticated imaging devices and computerized equipment. Our full comprehesive eye exam will not only determine your vision prescription, but the doctors will also check your eye health for any diseases, assess how your eyes work together, and your overall health. It is esstenial for you to have a complete eye exam on yearly basis. The comprehensive eye exam consist of multiple test, some will require your cooperation, some will not. Your refractive error (your vision prescription), intraocular eye pressure, visual field testing, fundus photos will be tested. Color vision and depth perception will also be tested in some cases. In addition to the full comprehensive eye exam, our contact lenses assessment will measure your cornea to make sure your contact lense has a proper fit, comfort, and vision. Whether you are a new wearer, an established wearer, or just thinking of contacts, rest assured we will have you in the best contact lenses for your needs. For all new wearers, our staff will provide you with instructions and proper care with contact lens use. There are three types of modes for contact lens wear. Single Vision : Most patients will wear single vision CL Rx. For patients who wears bi-focals or progressives, you will need to wear over-the-counter reading glasses for near work. Mono-Vision : Patients who do not want to wear any glasses at all when wearing contact lens, will opt for either this option or multi-focal contacts. As a mono-vision wearer, your dominiate eye will be corrected for distance while your other eye will be corrected for near. With both eyes working together, your brain will interrpret your vision for far and near. With this option, you will experience a slight reduction in depth perception, but you will be able to function in your daily activies. Multi-Focal : Patients who do not want to wear glasses, but still maintain depth perception will opt for this premium fitting. With this option, you can function in your normal daily activies. However, the clarity will not be perfect. These lenses are Multi-focal, its correcting your individual eye for far and near at the same time. Whichever modality you choose, we will assist you in everyway so that you are comfortable and vision is the best that it can be. Any red eye, eye trauma, eye pain, or abnormalities in your vision should be assesed right away. If you wear contact lens, you should removed them and use your glasses for the time being until assessment. If we are unable to see you, or if you are unable to come in, you should seek medical care at the nearest emergency room.